THE APOCALYPSE HAS COME. Now you're in charge. What kind of society will you make? After nuclear war destroyed civilisation, the time has now come to rebuild. But what will you legalise, and what will you forbid? 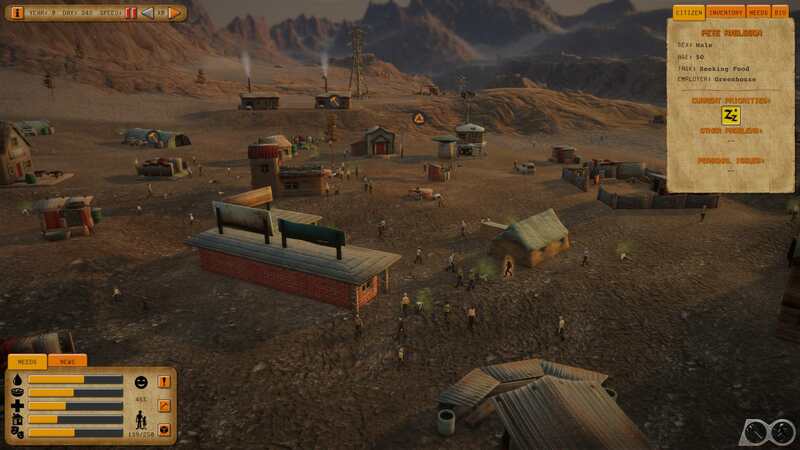 Run society the way you want, good or bad, and create a successful settlement that can keep hundreds of survivors alive in a dangerous wasteland where life is always hard. CRIME. Citizens who commit crimes and a wide range of social issues as you play. JUDGEMENT. Act as judge over a range of social issues including abortion, murder, vegetarianism, drug use, cannibalism, and several other controversial topics. PUNISHMENT. Choose between execute, long or short prison sentences, tolerate and even encourage for all the issues that happen in your town. Be whatever kind of leader you want. BELIEF. Pick what you believe in and share that with others through violence, exile or education so that your laws are listened to. OUTSIDERS. 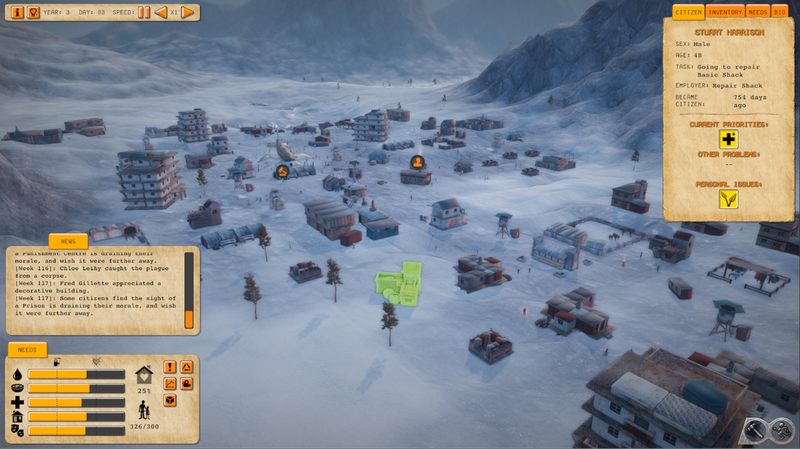 Build defences to keep raiders out of your town for good, or make deals with them so they won't attack you. CONTROL. 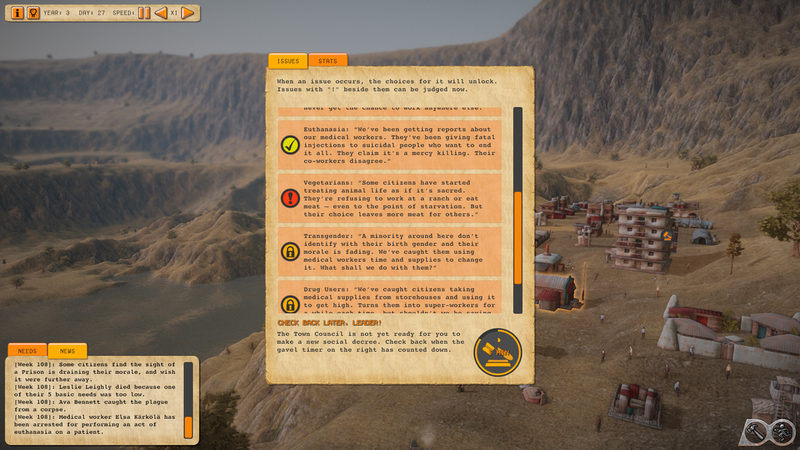 Create and name your own leader character and use this person to help build your town, or explore the world for salvage and special upgrades. Walk around your town. SURVIVE. Starting out with nothing, slowly build a large settlement that can keep hundreds of people fed, watered, healthy, housed and entertained, if you can. 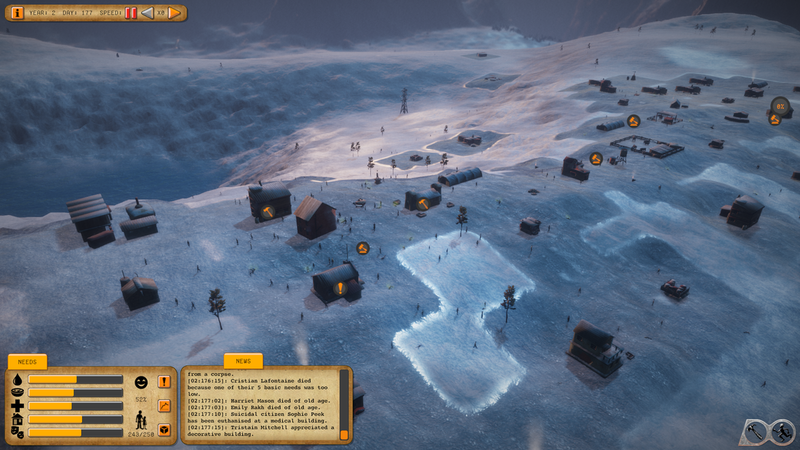 Convert ruined houses and offices into useful buildings or loot them for supplies. A large degree of randomisation to make replaying and building a different society still challenging and rewarding.